Pork belly buns have become a theme for me over the past few years. The first ones I did used a sous vide and grilling double cooking method, then I started going for straight up smoked pork belly and had some pretty fantastic results doing them both in Texas- and burnt ends-style. 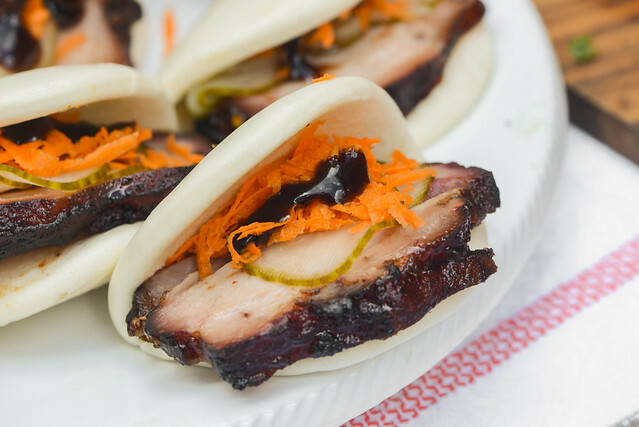 Since you can never have too much of a good thing, I just kept rolling with my belly buns and have now a fourth incarnation to share, this time doing them up with a char siu sauce. I made these during a Meatwave where I had multiple char siu recipes going on, which let me just make a giant bowl of sauce and spread it across a number of dishes. 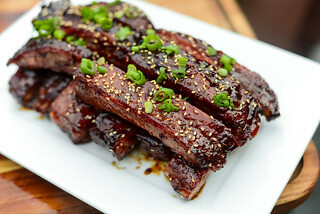 I altered my usual recipe for this Chinese "barbecue sauce" by bringing in the traditional ingredient of red fermented tofu, and while I think it did lend a more unique flavor to my char siu, if you don't have this special ingredient on hand or can't find it, I know from experience that omitting it still creates just as tasty end results. 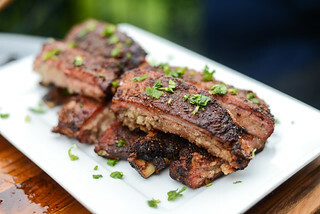 I had previously done some smoked pork shoulder steaks in a char siu style and developed a method of using both a rub and sauce for maximum flavor. I saw no need to change up something that already works here and did the same thing, putting together a simple rub of just five-spice powder, dark brown sugar, and kosher salt. I then applied the rub pretty liberally to the couple pieces of belly I had bought. I got mine from my local Asian market, who sells them already cut into these ideal long rectangles, which will shrink up during cooking to be a final shape and size well suited for stuffing into steamed buns. That grocery does only sell belly with skin-on, so I just cut that off before smoking since the skin wasn't desirable for this particular preparation. After seasoning the pork, I placed the pieces in a large resealable bag and poured in the char siu sauce. 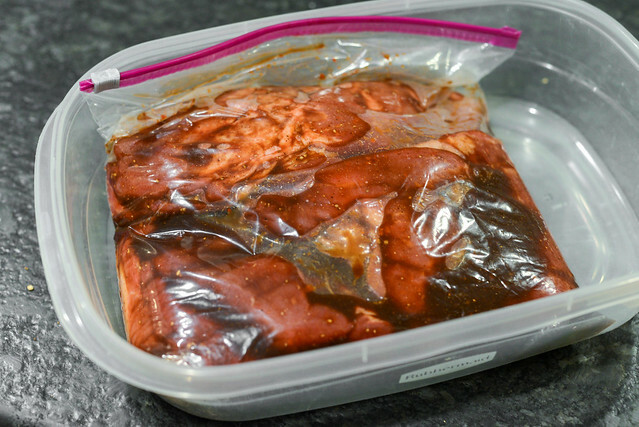 I then set that bag in a container—just to avoid any mess in case of leaks—and let the meat marinate in the fridge overnight. Since this isn't a very acidic marinade, long soaking times are no problem and I've even prepared my char siu a couple days in advance with no ill effects. Another running similarity between all of my steamed bun recipes are these quick pickles. I could be creative and think of new toppings, but these pickles are so damn delicious, I take every excuse I get to make them. 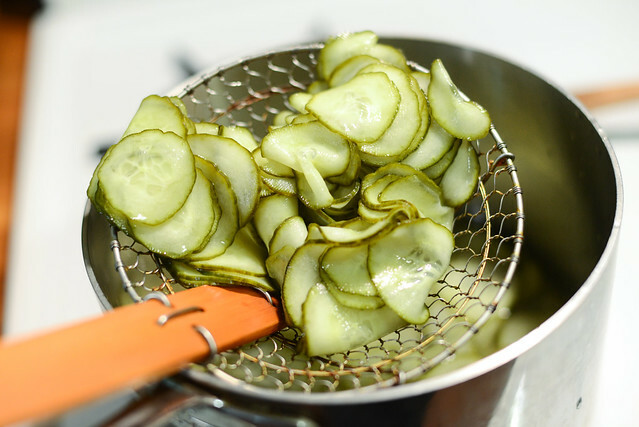 They're also fast—hence "quick pickles"—and after thinly slicing a seedless cucumber on a mandoline, they only take about ten minutes to be fully flavored after being submerged in a sweet and acidic brine. Like most all pickles, they also keep well, so this step can be done up to a month in advance. There wasn't anything special about smoking the belly—I just placed the pork in the smoker that was running at 225°F with charcoal and a couple chunks of pecan and just monitored the internal temperature of each piece with my handy CyberQ. My final target was in the 195-203°F range, which seems to be the ideal temperature for the softest, most luscious fat. 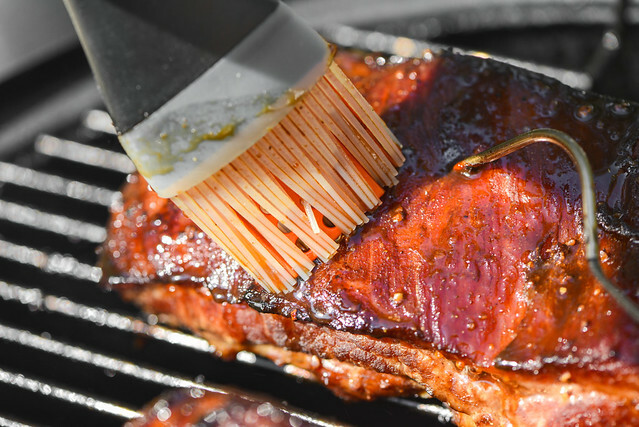 I also wanted to apply more sauce during the cooking to give the pork that shiny char siu glaze, so began brushing the belly with some reduced sauce about every 45 minutes in the last couple hours of cooking. In the end, I had some pork that was beautifully red, glossy, and super tender. I also know from experience that the meat is even juicer if it's wrapper and has some time rest, so I encased each piece of belly in foil and placed them in the Cambro to sit until I was ready to serve. For me that was a little over an hour, but a 15-30 minute rest outside of a cooler should be totally fine. I was greeted by some pretty fine looking meat when it was finally time to slice into it. The belly was soft and moist, but not so overly tender that it fell apart when cut into. Sneaking a little taste for myself while preparing the buns confirmed that exterior glaze had all the complex sweet and earthiness of a great cha siu. But really, it didn't live up to its full potential until assembled into buns. Into each soft steamed bun I added a slice of the belly, some grated carrot, a few pickle slices, and a little dollop of hoisin. The contrasts of textures and flavors here came together incredibly well, with the pickles adding some acidity to counteract the sweetness and cut the fat, while the carrots provided a bit of freshness. These just further solidified that pork belly buns are one trend that doesn't need to stop, so don't be surprised to see them keep popping up on The Meatwave again and again. 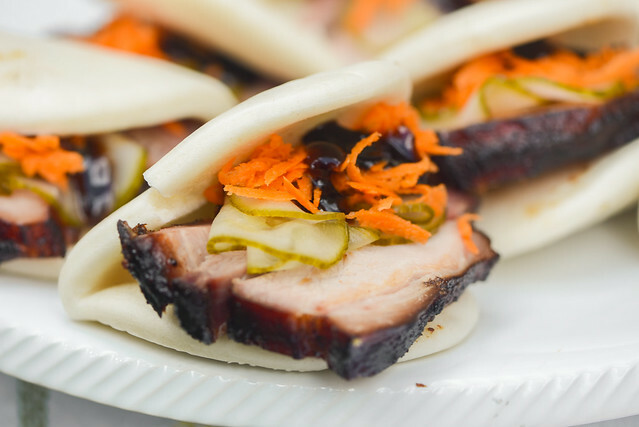 Sweet and earthy char siu sauce provides a ton of flavor to smoked pork that's sliced and served in steamed buns to make an excellent little snack. 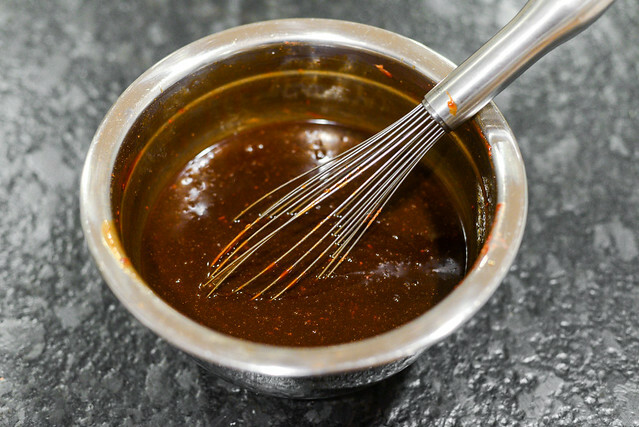 To make the sauce: In a medium bowl, whisk together hoisin sauce, honey, soy sauce, rice wine or sherry, fermented bean curd, fermented bean curd sauce, and 3/4 teaspoon of five spice powder. Set aside. 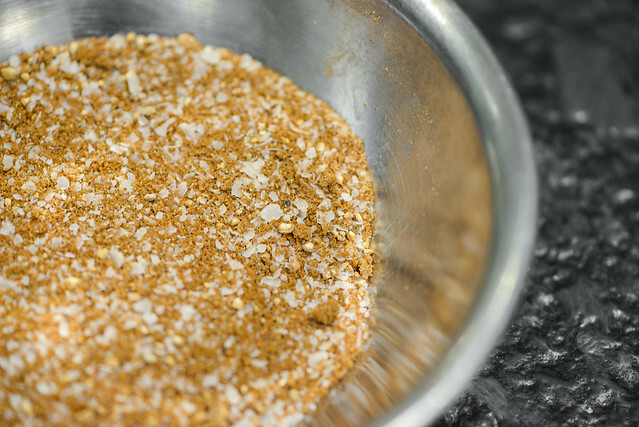 To make the rub: Mix together 2 tablespoons Chinese five spice powder, brown sugar, and salt in a small bowl. Coat pork belly all over with rub. Place pork in a large resealable plastic bag. Pour in char siu sauce, seal, and toss to thoroughly coat pork. Place in refrigerator and marinate overnight. 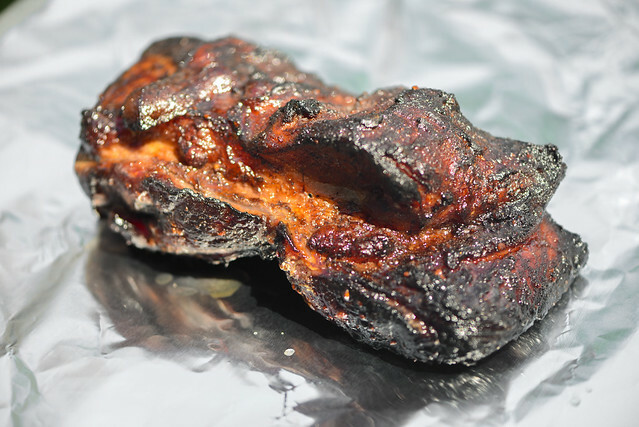 Fire up smoker or grill to 225°F, adding chunks of smoking wood when at temperature. 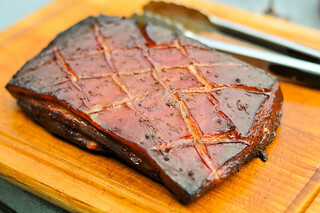 When the wood is ignited and producing smoke, place pork belly in smoker or grill, reserving marinade. Smoke until an instant read thermometer registers between 175-180°F when inserted into the thickest section of the meat, about 5 to 6 hours. 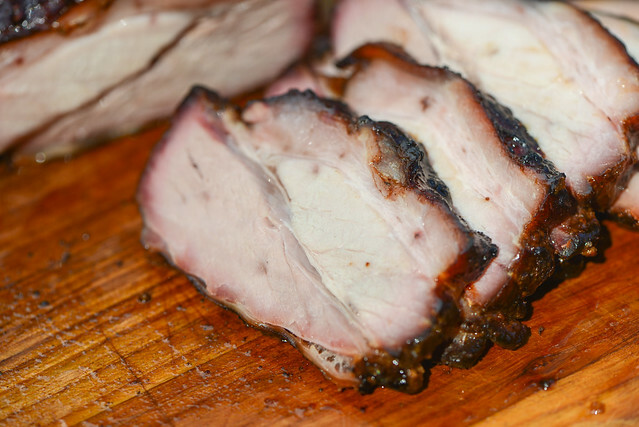 Brush pork with reduced sauce and continue to smoke until an instant read thermometer registers between 195-203°F when inserted into the thickest section of the meat, about 2 to 3 hours more, brushing pork with sauce again every 45 to 60 minutes. 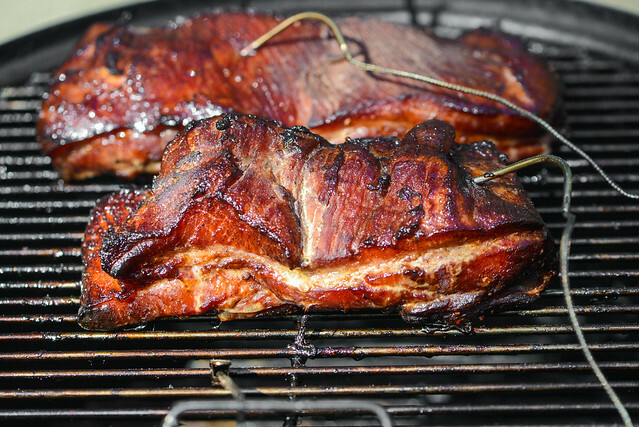 Remove pork from smoker, wrap in foil, and let rest for 15 to 30 minutes. 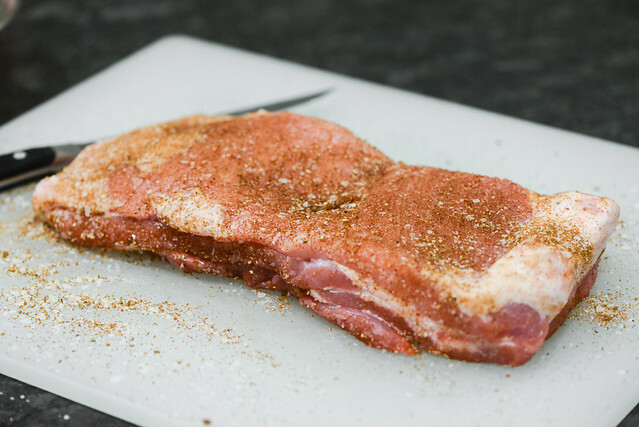 Cut pork into 1/4-inch slices. While pork is resting, steam buns in a bamboo steamer or in the microwave on a large plate under a damp towel until soft and heated through. Place a piece of pork in each bun and top with pickle slices, grated carrot, and a dollop of hoisin sauce. Serve immediately. A little typo in the recipe - the second "for the pickles" entry. Someone not paying attention might get some very interesting pickles!